Take the Event Satisfaction Survey! Click HERE to download and share the image above. 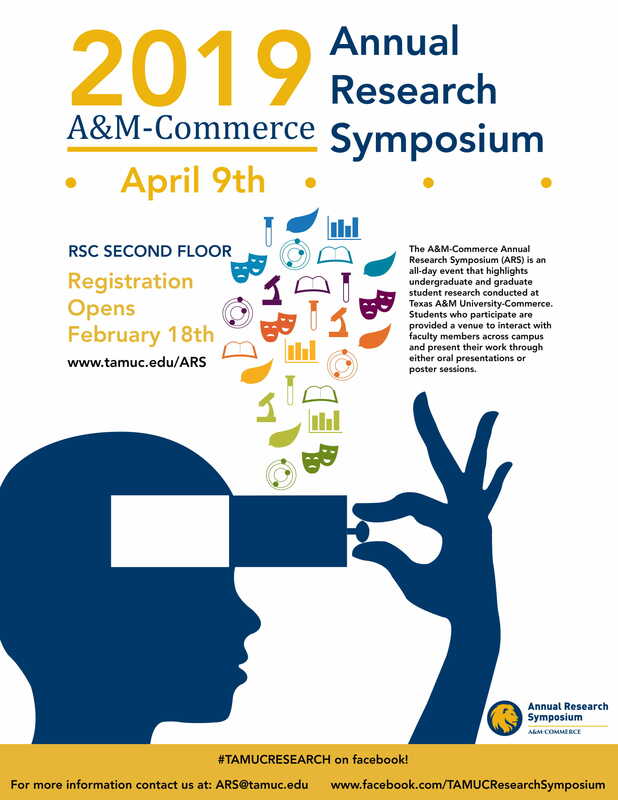 What is the A&M-Commerce Annual Research Symposium? The A&M-Commerce Annual Research Symposium (ARS) is an all-day event that highlights undergraduate and graduate student research conducted at Texas A&M University-Commerce. Students who participate are provided a venue to interact with faculty members across campus and present their work through either oral presentations or poster sessions. This event allows students, faculty and staff, alumni, and the community to see the depth and breadth of research conducted at A&M-Commerce and is a valuable tool in meeting the university’s mission of creative discovery and dissemination of knowledge and ideas. A&M-Commerce’s Annual Research Symposium is supported by several academic and nonacademic departments on campus. The event combines different aspects of university research including the previous Annual Research Symposium hosted by the College of Science and Engineering and the Graduate Assistant Research Symposium. The A&M-Commerce Annual Research Symposium is sponsored by the Office of the Provost and Vice President for Academic Affairs and organized by the Office of Sponsored Programs along with the ARS Planning Committee. All A&M-Commerce undergraduate and graduate students are invited and encouraged to participate. All faculty are encouraged to facilitate students’ participation and to volunteer as judges on the day of the event. The university community, along with alumni, is invited to attend the poster or oral presentation sessions and support the student presenters. The mission of the A&M-Commerce Annual Research Symposium is to recognize and celebrate student research by providing a venue for students to showcase their work and to foster an environment for students, faculty, staff, administration, alumni and the community to learn about and support the research being conducted at Texas A&M University-Commerce.